Last Saturday, 8:15 a.m. Weather: snowing lightly. Trail conditions: snowpack with good traction. One other car in the parking lot. I step out of my car, tuck the key in my pocket, and run. Up the hill in the woods, Ponderosa pine too big to hug anchor the horizon. Manzanita glistens with fresh powdery snow. I know the trail like the hallways of my home, but never tire of it. Leap this rock here, power down this hill here. Stop on the bridge for the briefest moment to absorb the view—wintry today, the clear waters of Tumalo Creek icy and glittering—and breathe. The first time I walked the loop at Shevlin Park (just a few miles northwest of the Bend city limits), I was 16 and it seemed like a hike. That was ten years before I moved to Bend and absorbed my quotient of the local water, which may be infused with an elixir holding the power to morph normal people into athletes. Live here long enough and you’ll find yourself accomplishing daily before breakfast what used to count for a weeks’ worth of exercise. The first time someone suggested that we run the Shevlin Loop, I was skeptical—of my own ability. I have had my moments, but in fourteen years of drinking Bend water, I have never quite transformed into a rabid athlete. Mountain biking and road biking were tried and abandoned. Same for snowboarding. I still have never rock climbed or mountain climbed. What stuck, however, is running the Shevlin Loop. Now it’s something that I do once a week, year-round, in all kinds of weather—if not quite before breakfast, then usually soon after. 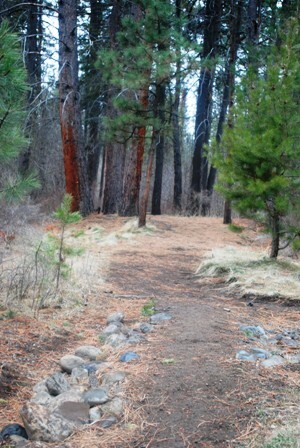 There are many reasons Shevlin Park keeps drawing me back. Within its 652 acres are wildlife, a pond, a covered bridge, developed and undeveloped trails, massive old trees, and plenty of peace and quiet. Even on a crowded weekend, take off on the trail and within a few minutes discover the shelter that only a wide-open forest can provide. Today, I have plenty of solitude. I pound the trail alone. Until—two miles in to my run, another runner approaches. As he passes, he chuckles. “I thought I was the only other crazy one out here.” Guess he hasn’t drunk enough Bend water, either. Nationally-published writer Kim Cooper Findling grew up on the Oregon Coast and has lived in Central Oregon for nearly fifteen years. She loves to explore every corner of her home state, usually with her husband and two daughters in tow. Her work has appeared in many publications over the last decade, including Travel Oregon, Horizon Air, Oregon Quarterly, Sky West, The Best Places to Kiss NW and High Desert Journal. Kim’s first book, Chance of Sun: A Perfectly Imperfect Oregon Upbringing, will be released this year. See www.kimcooperfindling.com.